Your lighting choices can have a significant impact on style, comfort, energy savings, and property value – here are a few pointers on how to find what’s best for you. Make the best lighting choices to suit your budget and lifestyle. Light bulb options range from incandescent and compact fluorescent light (CFL), to halogen and light-emitting diode (LED) lights. LED lights lead the way, as long as they’re of high quality and more energy efficient than any other light option on the market. On average, LEDs are four to seven times more efficient than halogen or incandescent lights, last up to 10 times longer than halogen lights (20,000 to 50,000 hours), and can halve your energy costs. They generally cost more upfront, ranging from $10 up to hundreds of dollars, but they save big money in the long-term and provide exceptionally warm lighting that can really bring a room to life. LED-based fixtures, in which the bulb is conjoined to the fixture, generally last many years. This increases resale and rental opportunities, and eliminates the hassle of having to change lightbulbs all the time. Changing to LED will necessitate hiring an electrician to change the light fittings in your home or business. Various fitting options are available, from classy pendant lights to recessed downlights. Installed recessed LED lighting expands the impression of roominess, adding a rental and resale incentive to potential buyers, and bringing years of comfort and relaxation to the homeowner. While fitting changes are certainly a cost in the short-term, flicking the switch to change to LED is a forward-thinking move. LED lights can also provide exceptional colour warmth, if desired. Buying LEDs that are a warm colour temperature ranging up to 2,900 Kelvins will bring soothing ambience to the home or, for example, as lighting outside the front door. One downside to some LED lights is that certain types emit light in one main direction rather than entirely diffusing it equally through the room or space, although various LED bulbs are available that are omnidirectional, casting light throughout the room like an incandescent bulb. This is something to check when deciding on what kind of LED you will buy. Installing LED lights can also pave the way to apply for some nice rebates, which vary depending on your state of residence. CFL lights have an average life of 8,000 hours and are somewhat less energy efficient than LED lights, but much more energy efficient compared to incandescent. These lights are available in pleasant hues of warm, soft and bright white, so that can be a draw for the decision to install CFL lights as well. CFL lights do take a moment to “warm up” to full brightness, due to how they work, and are not ideal when you want a light that becomes bright immediately when it’s switched on. They can also be negatively impacted by cold (unlike the other kinds of lights discussed here) and are not able to be thrown out in the household trash, as they contain argon and mercury vapour. CFL lights also can’t be run with a dimmer switch. Halogen bulbs run on a tungsten filament, the same as incandescent bulbs, but are filled with halogen gas. They are 20 per cent more efficient than incandescent bulbs and switch on immediately, unlike the slight delay experienced in a CFL. Halogen lighting produces a bright, crisp light similar to daylight and can be used with a dimmer switch. They can really brighten up a room, and can be especially good in areas where you want optimal visibility, such as around a bathroom mirror, or as a recessed light to read in the den. One drawback to halogen lighting, in addition to the fact it doesn’t come close to rivalling LED energy savings, is that halogen bulbs may explode if changed by hand due to hand oils causing them to overheat. Incandescent light bulbs don’t have a long life (average 700 to 1,000 hours) and they waste a lot of energy. That said, they do throw off a nice warm glow, can be run on a dimmer switch, and produce a good old nostalgic feeling. 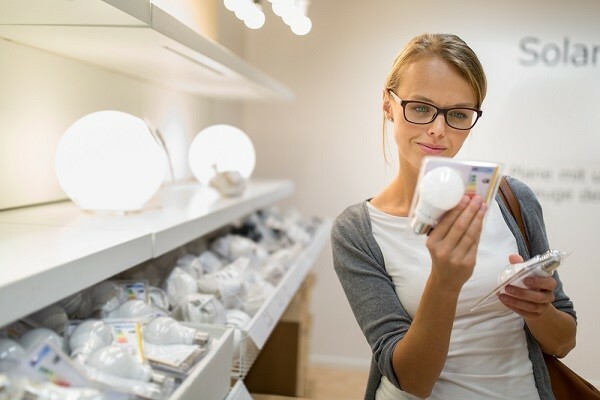 With equally ambient options on the market that will save a lot of money, it’s easy to see why incandescent bulbs are on the way out. If you’re considering a switch to LED or CFL instead of currently-installed halogen or incandescent lighting, keep in mind that it doesn’t have to be all or nothing. One option is to throw light on the issue by upgrading one room at a time and see how sustainable lighting works to increase ambience and energy savings.